BGR Energy Systems Ltd’s stock rose 14.1% on Friday after it emerged as the largest bidder for a portion of NTPC Ltd’s tender for power equipment. The five turbine-generator win will boost the company’s order book to ₹ 11,000 crore, up by nearly half. But things have sobered a bit over the weekend as investors realized that this set of orders alone may not be able to sustain the company’s earnings growth and strengthen its balance sheet over the next year. For one, this is a long-term order and BGR Energy is unlikely to book any revenue from this order in the current fiscal year. At best, it will boost revenue starting from fiscal 2013 (FY13). The firm needs to win short-cycle orders to book revenue over the next couple of quarters. According to Nirmal Bang Securities Pvt. Ltd, “As most of the order placement under the 12th Five-Year Plan is over and fresh placement under the 13th Plan is not likely to start before FY14, the boiler-turbine-generator industry faces a dearth of orders over the next two years." BGR Energy has bid for a couple of projects floated by the Rajasthan State Electricity Board that are awaiting environmental clearance, and another order from NTPC, which is caught in a legal wrangle. Secondly, the consensus among brokerages is that the company’s bid was too aggressive; the final quote was ₹ 1.01 crore per megawatt, which is below the industry average. The firm itself is confident of 10% profit before tax margin, but even that is slightly below current numbers. The key worry is that margins may shrink structurally because of rising competition. 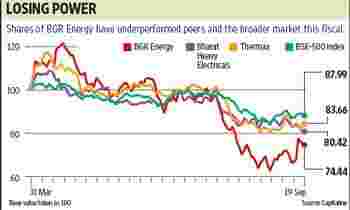 BGR Energy is also suffering from overcapacity, reckons Citigroup Global Markets Inc. The brokerage says BGR Energy should be building 15 sets of turbine-generators at a time to run at full capacity. The lack of orders for boilers will also begin to bite. Decreasing margins will be a double blow for a bleeding company. Its operating cash flow turned negative in the last fiscal. The company has seen profits shrink in the past couple of quarters. Moreover, despite a decrease in sales, working capital costs are rising fast as receivables pile up. These factors will continue to cap valuations and upsides in the share price for quite some more time.